His party won 17 seats (of the 54 in undivided Bihar) with a 27 per cent vote share in the state. However, in 2019, for the first time in almost three decades, the Yadav patriarch will not be present for campaigning. As he lies in a hospital bed in a Ranchi hospital owing to several ailments after being convicted in a number of fodder scam-related cases, campaigning in Bihar is threatening to be a dreary affair in his absence. Prasad has dominated campaigning in Bihar since 1990. Every election campaign since he became chief minister that year revolved around him. While opponents blamed Prasad for making Bihar a laggard state, he ridiculed them with witty nick-names and won crowds in his rallies with his pithy one-liners. He mocked Lok Janshakti Party chief Ram Vilas Paswan by calling him “Mausam vaigyanik” (political weathervane) and dubbed Bihar Chief Minister Nitish Kumar “Paltu Ram” after he broke the Grand Alliance and teamed up with the Bharatiya Janata Party. His mimicry of Prime Minister Narendra Modi during the campaigning for the Bihar assembly election in 2015 caused hilarious laughter in the crowd. Rustic humour is the way Prasad used to drive his political message to his voters. Political analysts, however, say the impact of his absence will be much deeper than just the election becoming tedious. Many political observers, including some RJD leaders, believe this election would decide the way forward for his party and family. The election would also be a test for his younger son and political heir, Tejashwi Yadav. While Prasad’s opponents say his incarceration would loosen his grip on Yadav voters, his loyalists think it would solidify his Muslim-Yadav combine. When Prasad campaigned, from 1991 to 2005, the erstwhile Janata Dal and then the RJD topped vote percentage charts. In 1991, riding on the wave of the Mandal Commission, the alliance of the Janata Dal, Communist Party of India, Communist Party of India-Marxist and Jharkhand Mukti Morcha won 48 of the 54 Lok Sabha seats. The vote share of the Janata Dal alone was more than 34 per cent and it won 31 seats. Many political functionaries are saying as Prasad is behind bars, the RJD’s vote-transferring capacity might be affected. In the last couple of polls, there has been attrition among Yadav voters. This is particularly higher in the areas where the RJD didn’t field Yadav candidates. “With Prasad not being there to sway voters, this number is bound to go up,” said a political analyst. The Grand Alliance also fears with Prasad not playing a central role, it would have to go the extra mile to ensure the support of the backwards and the downtrodden. “In 2015, Prasad used the Rashtriya Swyamsevak Sangh Sarsanghchalak Mohan Bhagwat’s remark suggesting a review of the reservation policy against the saffron alliance. He used to wave the book of RSS ideologue Madav Sadashiv Golwalkar to paint the BJP as anti-backward. While BJP leaders tried their best to clarify things, Prasad single-handedly kept it alive and at the end it cost them dear,” said an RJD MLA. 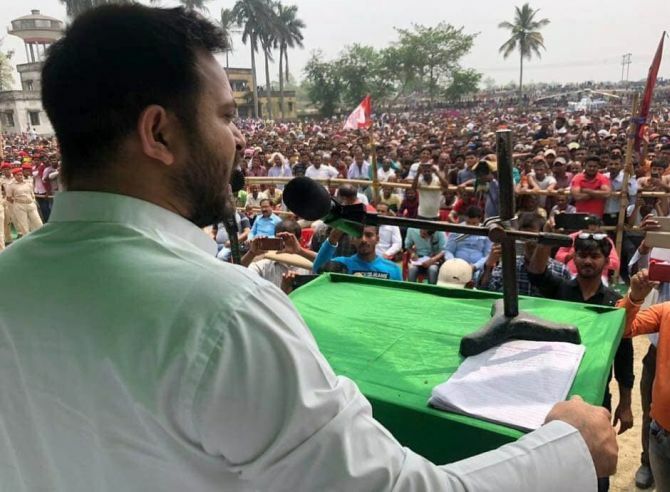 In the absence of Prasad, the political mantle of Tejashwi will also be tested. Although he has strengthened his position in the RJD, the young leader is yet to earn the trust of the crowd. Even senior RJD leaders accept that he is no patch on his father. The growing distance between him and his elder brother Tej Pratap Yadav is another matter of concern. After Tej Pratap filed for divorce last year, he moved out of Rabri Devi’s (his mother) official bungalow in Patna. The elder brother even held close aides of Tejashwi responsible for creating rifts within the family. The situation worsened since Thursday. Tej Pratap resigned as mentor of the RJD students’ wing after Tejashwi refused tickets for his candidates of choice for Jehanabad and Sheohar. This time the National Democratic Alliance leaders are weaving their election campaign for Bihar around development, good governance, and clean government. “Nitish Kumar has done so much for Bihar,” said the JD-U’s spokesperson Neeraj Kumar.